Bring a fresh, false look into your bathroom with this vanity. Put together your perfect bathroom with this stylish vanity set from GLACIER BAY. This modern vanity set belongs to the exquisite Xena Quartz design series. It features a rectangle shape. This vanity set is designed to be installed as a floor mount vanity set. It is constructed with plywood-melamine. This vanity set comes with a melamine finish in Dawn Grey color. It is designed for a deck mount faucet. An ideal complement to a contemporary decor, the 48 inch Malibu Single Sink Vanity embodies the clean edges and sophistication of modern design. The grey cabinet, made of solid oak lends a warm feeling to your bathroom that contrasts beautifully with the Carrara White Marble top. Sleek and simple brushed nickel hardware dresses up the European soft-closing sliders and doors, which give you ample space to store your bathroom items. Millstream 25-inch W Vanity in Grey Bring a fresh, false look into your bathroom with this vanity. Put together your perfect bathroom with this stylish vanity set from GLACIER BAY. 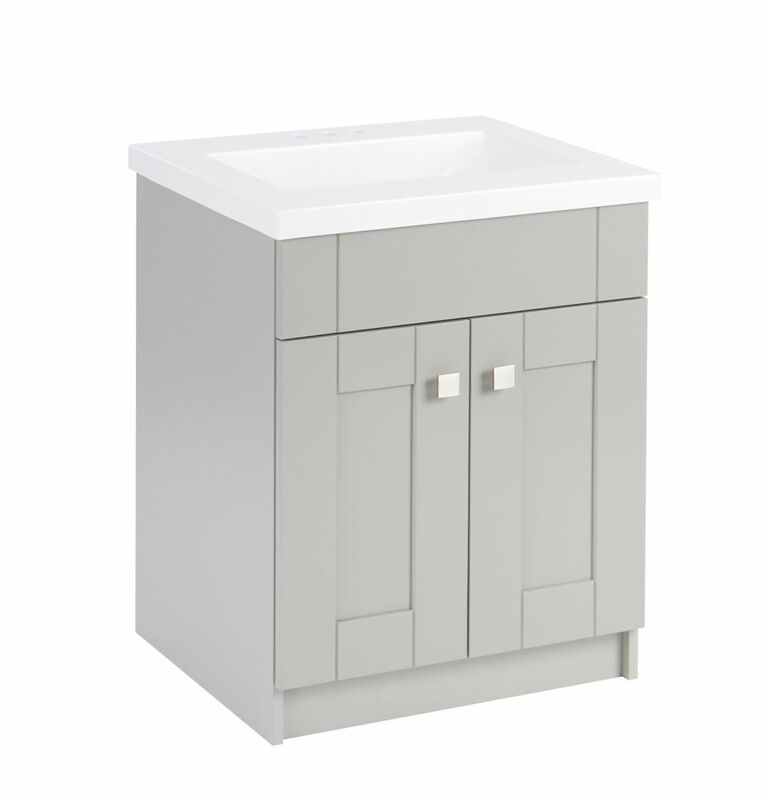 Millstream 25-inch W Vanity in Grey is rated 1.0 out of 5 by 1. Rated 1 out of 5 by Anonymous from Shocking bad countertop First one was cracked, no box damage whatsoever, so probably packaged damaged. Second replacement had a huge void in the drain section and literally crumbled when the drain was installed. It looks nice though and the HD staff was very helpful in replacing it. Here's hoping the third try is successful.